Jeez, yeah, ridiculous. Your ship is almost impossible to control, and as for the "bouncing bombs," well, what a great idea: A BOMB THAT BOUNCES OVER YOUR ENEMIES. I agree that the game is beautiful, but how difficult would it have been to make it playable? allthough the game has outstanding gfx and good musix, the gameplay is very poor. it is almost impossible to finish at least one level with these strange "jumping" bombs and other obstacles. besides the game has no save-option, how should one finish all 25 levels at once ?!? In my eyes the game is only playable when the collision detection is "switched off", but still the game is very boring... GFX: 10 points, gameplay: 1 point... -Andreas Magenheimer. "What do you mean you're frightened of insects?! How can you be you're an officer in the Royal Army of Amaurote? Someone has to clear the city of these insects and you are by far our most able Officer for the job, well actually you're the only one left. Now I understand that these insects can be a little, well nasty, although I am quite sure you won't have any problems whatsoever. However as a safeguard we will provide you with an Arachnus 4 armoured car and our latest radar equipment. Now let me see, ah yes a two-way radio so I can make sure you're doing your job properly and so you can contact us for anything you need of course, and 30 of the newly developed bouncing bombs. I'm not too sure how the last series of tests on the bombs went, I have a feeling that they weren't terribly successful - but we don't have time to worry about that now do we? However I would prefer it if you didn't demolish too many buildings, we would like a city to go back to and not a pile of smouldering rubble. I suppose there is also the small question of money and whether you can be trusted with any. Well you may need some so I'll let you have $5,000,000 and yes I do want the change back! I don't want to hear any more excuses - just get on with the job and don't come back until you've destroyed every last insect!" With these, the dulcet tones of your Commanding Officer ringing in your ears, you find yourself back in the city of Amaurote. After the insect invasion everyone else, very sensibly, evacuated and the Army after a brief and bloody struggle has also been forced to withdraw. Unfortunately for you, as the only uninjured Officer left (that'll teach you for hiding during the nasty bits) you've now got to destroy all the insect colonies single handedly! 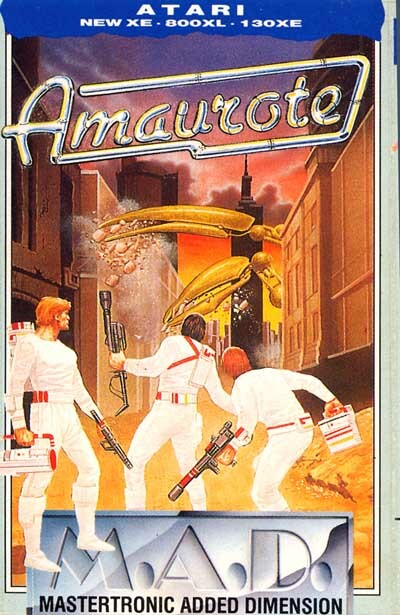 Amaurote is divided into 25 districts and each one has been infiltrated by the insects who have made themselves at home and established colonies. You have a map to guide you and you can tackle the colonies in any order you wish. 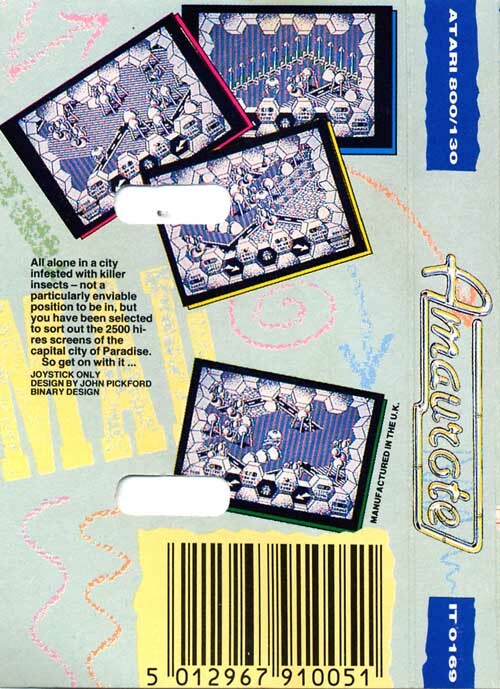 Each district is represented by a small disc and as you move your Arachnus 4 across the map the name of each district will appear at the top of the screen. Select which district you wish to tackle first by moving the Arachnus to the correct disc and pressing fire. If you manage to destroy all the insects in that district you will be returned to the map. There are three types of insects, all equally mean, and ugly! The Queen - As the most important and powerful insect you encounter, she should be your main target, but you'll have your work cut out fighting your way through the insects who keep her under close surveillance all the time. She has two roles, firstly to give orders to the drones who act on information provided by the scouts and to produce more insects. Every time you manage to kill an insect she will produce another one but the amount of time she takes to do this depends on when she was last fed. Scouts - The Scouts fly around the city on the look out for potential food supplies and intruders - that means you! If you're spotted, the Scout will rush back and tell the Queen and then you're in big trouble. Drones - Out of all the insects they're the most common, the most dispensable and the most stupid. They prefer to be told what to do and rarely make their own decisions, though there is one thing to be said for them, they never give up - and that's all the warning you're getting. Their job is to collect food for the Queen and defend the colony from intruders. Your supply of mega effective "anti-everything" bouncing bombs should be used with great care. Pressing a fire button will launch a bomb in the direction you last moved. The bomb will continue to bounce in that direction until it hits either an insect or a building - except that you're supposed to be saving the city, not demolishing it. Despite their trade name, there are two things in the city that cannot be destroyed by the bombs. They are the perimeter fence and the Queen. In order to set rid of her, you need a "supa-bomb" no less. You forgot to bring any of these with you, but it is possible to request one at any time. They're very expensive and very dangerous so it's probably just as well that you forgot them. Once a bomb has been launched, you cannot launch another one until that one has exploded. The number showing how many bombs you have left will flash red whilst a bomb is active, even if it is off screen. Bombs are air lifted into the city and you can use your scanner to locate them. If extensive damage is caused to your Arachnus 4, you may have to purchase a new one. You have $5,000,000 with you, but you know how expensive cars are these days so try not to overspend. You can program the scanner to find the nearest insect, the Queen and air lifted bomb. To operate just select the required mode and follow the arrows. Joystick only. Use the joystick to manoeuvre your Arachnus 4 through the city. and SELECT selects the object you're looking for. Press PLAY on cassette recorder. Hold down START and OPTION buttons while switching on the computer. Press RETURN, program will now load.